As you’ll probably know (as I’ve mentioned it quite a few times – I’m just excited, ok?! ), my boyfriend moved in with me last August and since then we’ve been turning my single-girl apartment into a cosy couple home for the two of us. One of our favourite things to do is procrastinate which is why it’s taken us so long so far and we’d much prefer to eat snacks and watch TV than do anything in the house! However, so far we have managed to do the wallpaper and my boyfriend has moved in his hi-fi equipment and several guitars (ahem). Next up on our list was to sort out the lighting. Luckily for me, my boyfriend is an ex-electrician (he’s now a super-cool hipster who owns his own record shop, in case you’re interested!) and so knows all about lights! 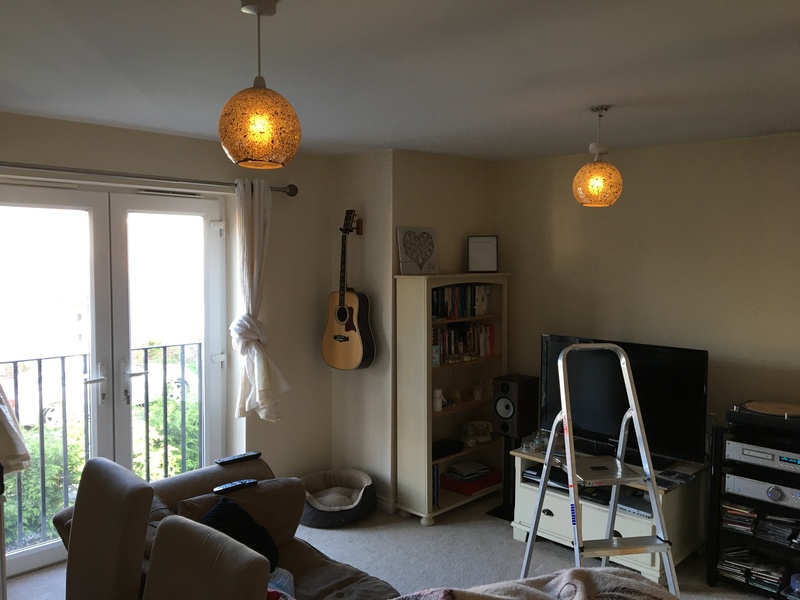 Lighting is such a big statement in any home so we were really keen to get it right. Here’s a before pic – complete with step ladder! Our house was built with two lights in the living room which was quite weird as they were kind of close together, which didn’t help to make the room any lighter than just having one light. There was also only one switch which powered both of them. 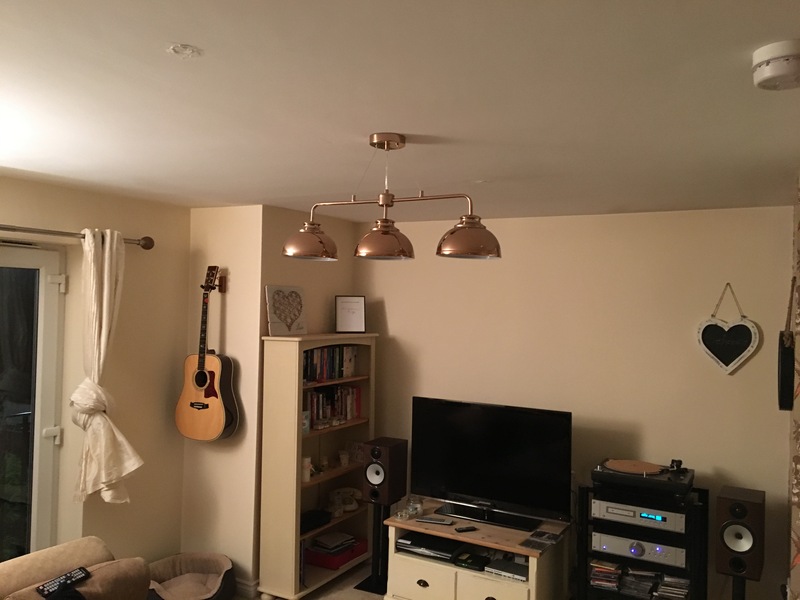 We decided to merge them into one and replace our existing fixtures with this Brooklyn Industrial Ceiling Pendant Bar in rose gold from Litecraft*. The industrial look is HUGE in interiors right now – think bare concrete, rope lights and wrought iron – and so I thought it would be great to incorporate this into our home and give it a bit of a trendy update. And an after pic – ignore the poly filler! The colours throughout the apartment are cream and gold (mainly cream as I am super minimalist!) so this light fits in perfectly with our colour scheme. There are three bulbs in the light as well, so this really add extra light to the room, something we have struggled with previously. I think it gives the room a more highly styled, fashionable look which I absolutely love. 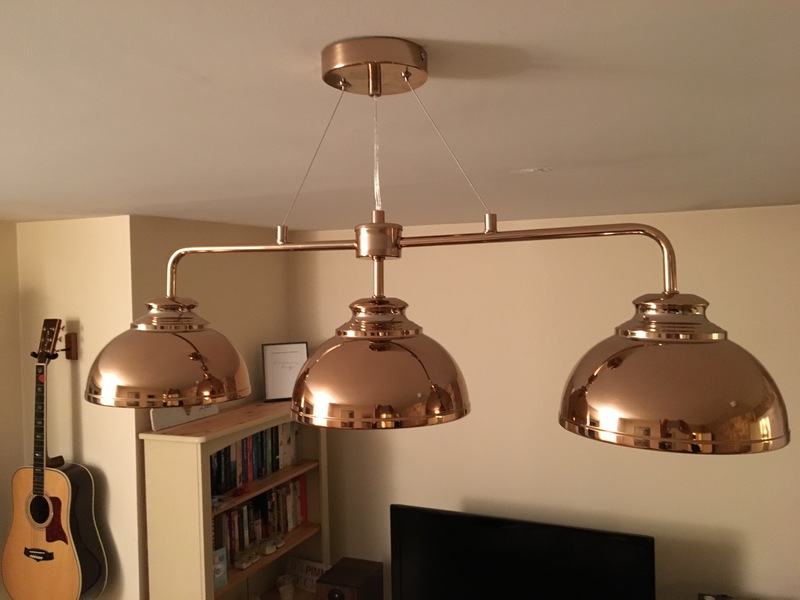 *Thank you very much to Litecraft who kindly provided us with the Brooklyn Industrial Ceiling Pendant Bar for this review.